This weekend sees the first PICO Bank Holiday Series of the year. Two races a day over three days and a chance of a trophy!! I am delighted to announce that this year’s party on the Saturday night will be totally FREE OF CHARGE to all members, visiting sailors and guests! We are thrilled to welcome back Jason West playing saxophone and singing to keep us entertained for the evening – if you missed him on Saturday night, do come along as you will be in for a real treat! Food will be available from Steve at the Galley Kitchen from 6.30pm til 8.30pm in the form of Tapas. It is not essential to book, but if you know you will be coming along it would be helpful to Steve to let him know so that he has a rough idea of numbers to make sure there’s plenty available. Prices will range from a fantastic £3.50 to £5.00 per portion and you can order as many or as few as you wish on the evening, depending on your appetite after a busy day of sailing! Hopefully it will be a nice sunny evening and we can enjoy each other’s company with the doors open, music wafting around, good food and one or two drinks to relax us. Apologies to lunchtime diners but I won’t be opening the kitchen today. This is a minor change to Section 7, Class and Fleet which updates PN numbers for 2015 where necessary and clarifies the intension that a group of asymmetric mono-hulls ( including RS200) are in the Fast Mono-hull Fleet. 2nd, 3rd & 4th May 2015. The new course is aimed at all Cadets who can sail and to wish participate in a race with a shorter course, more laps over a reduced time. There will be prizes for the older cadet as well as the less experienced sailors. A coach in a dedicated Support Rib will support the races. There will be an optional briefing at 16.00 (1 hour before start.) There are two races but you can choose only to one if you wish. The race will be a windward leeward course starting at the committee boat. It will be the second start with the Fast and Slow Monohulls at 17.03. (Time plus 3 minutes). First check the number of laps on the blackboard at the top of the slipway and / or check with Support Rib on the water. Your race does not use a shortened course. Once on the water, go to the Committee boat and look for the last number on the BACK of the boat, which indicates D on the diagram / or check with Support Rib on the water. 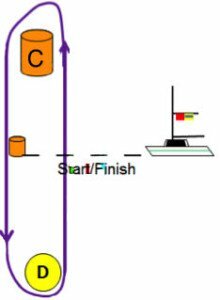 On the starting signal, you will cross the line and beat to the CADET BUOY, which is a special buoy marked with a C. This will be your windward mark, leave to Port. Run or reach down to the course. You must NOT go through the line on the downwind leg (as in the sailing instructions). Beat up through the line and onto the Cadet buoy and continue until the displayed number of laps are completed. As you cross the line the committee boat will record your time. They will not give you a signal. The Support Rib will blow a whistle unless is needed elsewhere. On Sunday there are two races. You can do both, but you will need to wait for the second race to be started. Check out the number of laps with the Support Rib.